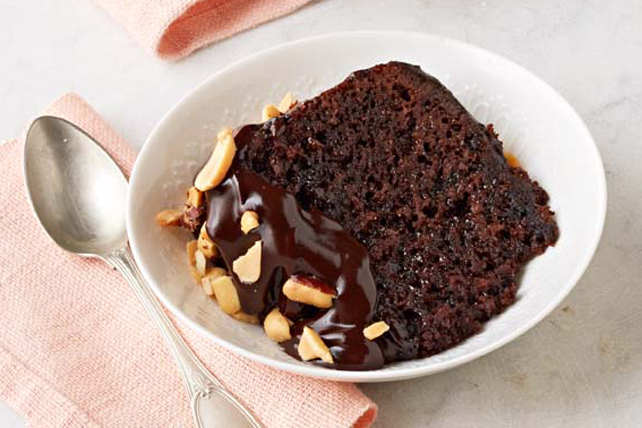 Amaze your guests with our Chocolate-Peanut Butter Slow-Cooker Cake! Start the slow cooker during the appetizer hour, and by the time dinner is over you will have this amazing warm, chocolate-peanut butter cake with a luscious chocolate topping. Beat cake mix, cold water and eggs in large bowl with mixer until blended. Add peanut butter; mix well. Pour into 4-qt. slow cooker sprayed with cooking spray. Break 2 oz. chocolate into small pieces; place in same bowl used to prepare cake batter. Add boiling water; let stand 1 min. Stir until chocolate is completely melted. Pour over batter in slow cooker; cover with lid. Cook on LOW 2-1/4 to 2-3/4 hours (or HIGH 1-1/2 to 1-3/4 hours) or until toothpick inserted near centre comes out with fudgy crumbs. Turn slow cooker off. Microwave remaining chocolate and Cool Whip in microwaveable bowl on HIGH 1 to 1-1/2 min. or until chocolate is completely melted and mixture is well blended, stirring with whisk after 45 sec. Spread over cake; sprinkle with nuts. Serve warm. Serve with frozen vanilla yogurt. Prepare using a yellow or spice cake mix.